« Nice Weather for December! Yukky weather! Overcast and drizzle. Good news, no wind and the temperatures might get into the upper 30s or low 40s for tomorrow and Saturday. Maybe some moisture by early next week. Christmas is almost here! So far this week, they have had 2-3 generators on the the morning and off by 10:00 a.m. Nothing except 20 cfs running for 6-7 hours and back on again. Oh yes, they blew one horn yesterday at 11:00 a.m. and turned on one unit for a short period of time. Just enough to get everyone’s attention, then they turned it off again !!! We are still seeing some browns and the ones we are seeing are beautiful. This one was caught by Mike a couple days ago. One of the other local fisher, another Mike, showed me a picture of another one yesterday…..gorgeous! I can’t remember when I have seen such beautiful brown trout! 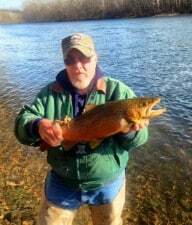 This entry was posted on Thursday, December 18th, 2014 at 1:16 pm	and is filed under Fishing Reports. You can follow any responses to this entry through the RSS 2.0 feed. You can leave a response, or trackback from your own site.